Voyage north up Seil Sound, to the Isle of Seil for lunch with Uncle Phil and Auntie Sue--- a broad lead in a light NW breeze up the loch, between the mainland and the islands (Shuna, then Luing, Torsa, and Siel) narrowing to the Bridge over the Atlantic. 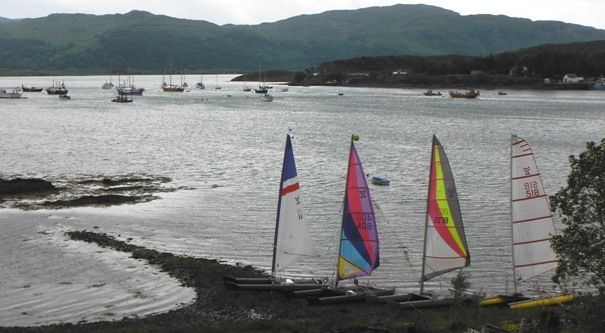 Easy sailing until the loch narrowed and the hills came in, ghosting in to the harbour. Above: Looking out over the harbour at the top of Seil Sound. Right: Physics prof. spotted taking tea in a wetsuit? The return from lunch: going in behind Torsa, first having a look at the tide pouring in through Cuap Sound between Seil and Luang, and then turning to go out the narrow exit between Torsa and Luing. Below: easing into the narrow gap between Torsa and Luing , open water beyond. Voyage to Crinan, south down the mainland coast and turning to port through the tidal gate Dorus Mor---the �Big Door�--- into the bay with Crinan Canal at the foot. 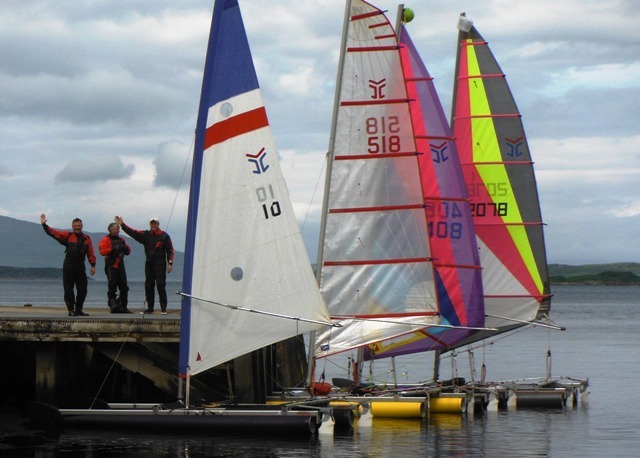 20 miles � about four hours' sailing, around lunch at Crinan.